by Diego De Brasi at Bryn Mawr Classical Review 2015.12.16. This book is a study of the literary strategies which the first professional philosophers used to market their respective disciplines. Philosophers of fourth-century BCE Athens developed the emerging genre of the "protreptic" (literally, "turning" or "converting"). Simply put, protreptic discourse uses a rhetoric of conversion that urges a young person to adopt a specific philosophy in order to live a good life. The author argues that the fourth-century philosophers used protreptic discourses to market philosophical practices and to define and legitimize a new cultural institution: the school of higher learning (the first in Western history). Specifically, the book investigates how competing educators in the fourth century produced protreptic discourses by borrowing and transforming traditional and contemporary "voices" in the cultural marketplace. They aimed to introduce and promote their new schools and define the new professionalized discipline of "philosophy." While scholars have typically examined the discourses and practices of Plato, Isocrates, and Aristotle in isolation from one another, this study rather combines philosophy, narratology, genre theory, and new historicism to focus on the discursive interaction between the three philosophers: each incorporates the discourse of his competitors into his protreptics. Appropriating and transforming the discourses of their competition, these intellectuals created literary texts that introduced their respective disciplines to potential students. 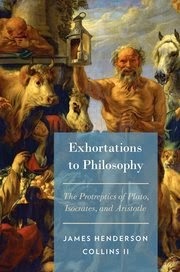 This book delineates a sharper picture showing how Isocrates, Plato, and Aristotle developed literary tools originating in archaic poetry into the forms of philosophic and scientific discourse that we still depend on today, tools that have since antiquity turned readers away from worse forms of argument towards better ones. Collins is the first to bring out how a rich, complex literary genre came to be. Protreptic belongs to a unique approach to philosophy; ancient Athens was a marketplace for ways of living philosophically. Anyone seeking to understand the climate of ideas in the fourth century should read this masterly study. In a later post I hope to discuss his conclusions about the "stabilized genre" of protreptic as it is reflected in the Protrepticus of Aristotle. In the meantime, check it out.